This dish happens to be very near and dear to my heart. When Tim and I were first dating, my parents were kind enough to host a dinner party for both our families at their lake house. My mom insisted it was important that I learn how to cook for my new man, and I finally gave in. This was only a few months after my first attempt to cook for Tim in California, where he threw up my add-water-only pancakes and my barely-thicker-than-water scrambled eggs. So I took my mom's advice, and we set out to make this particular dish for my future in-laws and my future husband. 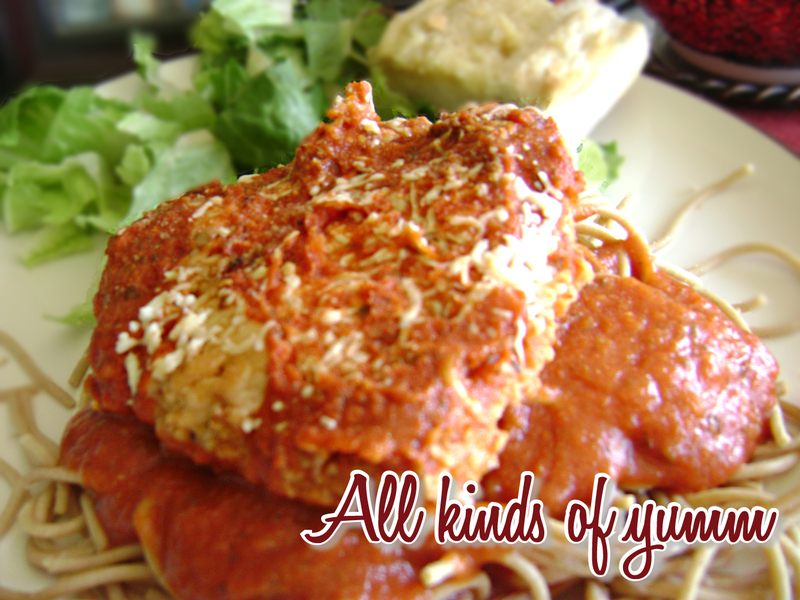 The great thing about chicken Parmesan is it's not a bunch of frills and lace. It's very meaty, filling and inexpensive, to which I very enthusiastically say, "amen." It looks much more complicated and fancy than it really is, but that doesn't change how divine it tastes. Take thawed chicken breasts and place in a large ziploc bag. Use whatever you have on hand to smash it until it's nice and thin. This can take anywhere from 3 minutes per side to 10 minutes per side, depending on your pan and the heat settings. Just keep an eye on it and peek every few minutes to make sure it's not burning. Once everything is finished, place a large portion of noodles on a plate, cover with warmed spaghetti sauce, and top with one of the chicken breasts. Probably the greatest thing about this meal is that it can be done well in advance. You just follow all of the steps except for baking the chicken and cooking the noodles, and 30 minutes before your guests arrive, throw the chicken in the oven and the noodles on the stove. ** Leftover Tip: Chicken parm makes for great leftovers, but if you have a leftover-phobic husband like I do, follow these steps to make a chicken parmesan sub: Grab a large sandwich roll (or 2 slices of Texas toast), cut it in half, and place mozzarella cheese on both halves. Throw it in a broiler or toaster oven until the cheese is bubbly. Cut up the leftover breaded chicken into long slices and place on top of the bread. Cover with remaining sauce, and there ya' go — they have a chicken parm sandwich the next day at work. I love your website. My husband and I have only been married for 3 1/2 months and you have a lot of really good tips. Thank you. LOVE chicken parm! Great recipe - thanks for the idea, and the sandwich tip is great! Yummmmmm! My mom used to make this all the time when we were kids, and this looks really simple. I think I'll make it for her next time she comes out.